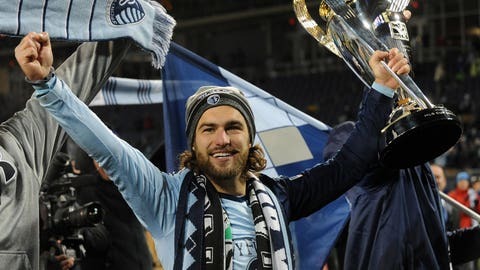 United States midfielders Kyle Beckerman (L) and Graham Zusi (R) will take the field for their club sides when Real Salt Lake and Sporting Kansas City meet in a MLS Cup rematch on Saturday. The two clubs left standing at the end of last season spent much of this week squabbling about their shared enmity ahead of their MLS Cup rematch on Saturday. Real Salt Lake and Sporting Kansas City share a history that extends well beyond their frigid, penalty-filled meeting to decide the title in December. The tension commenced with a preseason fight back in 2011 and simmered from there. It carried through Sporting’s 97th-minute winner at Rio Tinto Stadium in July and a series of exchanges about the aesthetic approaches preferred by both teams before and after Sporting’s MLS Cup triumph. And it lingers even through the buildup to this renewal of hostilities at Sporting Park. The pointed nature of the barbs – the sorts of comments amplified to trump up a game already worthy of attention on its merits – underscore the cause behind the continued success of both clubs: the consistency and the continuity (with one large, Jason Kreis-sized exception) within the playing and the technical staffs. 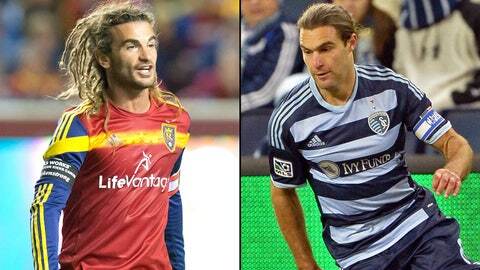 One MLS Cup isn't enough for Sporting Kansas City. This club wants to retain the title and search for others in 2014. RSL and Sporting have climbed to the top of MLS by establishing their operating principles, identifying players capable of implementing them and sticking by those terms to produce the expected results. The adherence to philosophy has yielded enduring success well worth trouble. Instead of chopping and changing in response to failures or shortcomings, these teams believe in their direction and supplement the core in place. The base of the side creates and maintains a culture frequently found in the league’s most successful teams. It isn’t easy. It requires good players – United States coach Jürgen Klinsmann leaned on RSL and Sporting to supply five of his 11 starters in the 2-2 draw with Mexico on Wednesday – and substantial patience to build the necessary foundation and wait for it to take hold. The benefits are there for all to see now. It isn’t just about the MLS Cups lifted (one for each during this era) or the matches won along the way. It is about how these clubs shaped their actions to sustain their progress over the long haul. Both teams can debate all they want about their disparate tactical setups and their distaste for the proclivities of their rivals, but the similarities provide the most compelling talking point. The ties that bind them together – the carefully laid plans to build a squad and develop a philosophy, the mixture of aggression and technique used to implement those ideas, the praise garnered for bringing the finished product onto a national stage – hold far greater weight in their chase for more trophies and in their chase to vanquish their opposition this weekend. 1. Keep an eye on the fullbacks at Sporting Park: Both teams demand significant, two-way contributions from their right and left backs. The balance may require some recalibration with RSL likely pressed into a change on the left (Rich Balchan or Abdoulie Mansally will deputize if Chris Wingert’s groin injury keeps him out) and Sporting weighing its options on the right (Kevin Ellis has played well, but Chance Myers is expected to feature in the 18 after recovering from a groin strain). If the resulting moves create uncertainty along the back four, then look for the other side to exploit the potential weakness with intelligent vertical passes up the revamped flank. 2. Expect the Cascadia hostilities to exert their usual toll in Seattle and heap pressure on the referee: The derby between Seattle and Portland actually unfolds like one more often than not with gritty, resolute fare often winning out on the day. If the usual tendencies rise to the fore once again, then the onus will fall on referee Hilario Grajeda to manage the match accordingly. Both clubs have spent the early stages of the season carping justifiably about the lack of protection afforded to Clint Dempsey (on tap for a return after serving a two-match suspension and starting for the United States in midweek) and Darlington Nagbe (an injury doubt for this game). This affair presents the sort of situation where one poor tackle can lead to the match spiraling out of control. Grajeda (100 matches refereed, 24.2 fouls called per game, per MLS statistics) must lean on his experience to navigate through the mire carefully to keep both teams in check and shift the focus back to the work performed when the ball is in play. 3. Caldwell suspension looms large as Toronto FC visits Columbus: TFC already faced a difficult task at Crew Stadium given the Crew’s dexterity and menace in possession. Steven Caldwell’s Disciplinary Committee-enforced absence now strips away much of the Reds’ defiant solidity at the back, too. The drop from Caldwell to potential heir Nick Hagglund (likely to start in Caldwell’s place, though Gale Agbossoumonde is also in the frame and regular left back Justin Morrow could tuck into the middle if Ryan Nelsen wants a complete revamp) is steep. Throw in Doneil Henry’s lingering knock and the Reds – already without Jermaine Defoe (hamstring) – might struggle to cope with the unblemished home side. Michael Harrington and Je-Vaughn Watson are eligible to play this weekend after an independent review panel overturned their dismissals on Thursday. 4. Texas Derby will test FC Dallas’ reconstituted midfield trio: FCD entered Saturday’s 2-1 victory over Portland with a makeshift three in the middle of the park and emerged relatively unscathed. 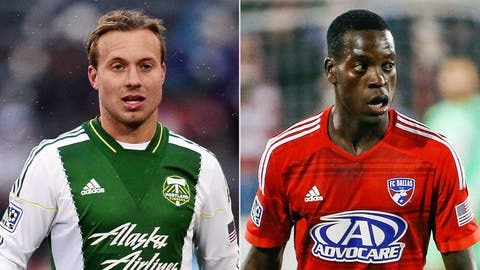 The selection issues in that department eased with Hendry Thomas back from suspension and Je-Vaughn Watson now saved from his potential ban after his controversial dismissal last weekend, but FCD will still need to adjust how it operates in the middle third against Houston. Dynamo boss Dominic Kinnear possesses plenty of versatile options in his four-man midfield – Boniek Garcia partnered Ricardo Clark in central midfield for the defeat in Vancouver, but he could slide outside to make room for Warren Creavalle to offer a different look to thwart recently anointed player of the month Mauro Díaz – to disrupt FCD’s rhythm. Keep a careful eye on how the Dynamo combats FCD’s in-form midfield triangle as the match progresses: Davis – as he showed with the United States in midweek – knows when to drift wide to stretch the shape and torment the fullbacks or pinch inside to add to the available numbers when required. If Houston can chop up the game appropriately and limit Díaz’s effectiveness between the lines, then the game will likely shift into its favor. 5. Jürgen Klinsmann certainly didn’t take Chivas USA’s interests into account in midweek: Klinsmann opted to leave Landon Donovan out of the starting XI for the friendly against Mexico and then prodded him after the game by noting his poor work in the buildup. Donovan said he eased off a bit to compensate for tendinitis in his knee and understood why Klinsmann decided to use him as a substitute. If Donovan decides to ramp into overdrive on Sunday afternoon as a method of response, then the Red-and-White could pay dearly for Klinsmann’s continued manipulation of LA Galaxy’s veteran attacking force.